Some of you may have scratched your heads hard after reading how Gwyn was playing "beaver" by the fire. There are beavers involved but no, no roasting involved. Meet the beavers we are talking about. 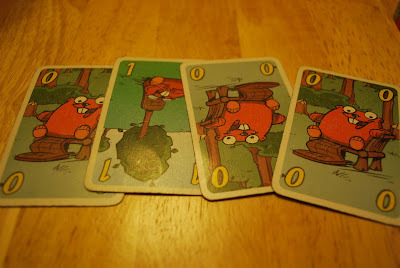 It's a German card game called Biberbande, which translates to Beaver Gang. It all started one fine evening. I was chilling on the sofa, in front of the fire place when two German friends, Christina and Stephanie brought out their beaver cards and asked if I wanted to play. "Sure, why not?" I reckoned. Shortly after, Gwyn walks by and joins in. Niklas, also from Germany though never knew of the game, joins in as well, followed by Nicola. That was the fateful moment where a fellowship was formed. The next few nights will be beaver nights. Every night, we will gather around the table near the fire to play "beaver". Quoting Christina, we've all got the beaver fever. Biberbande is a game of memory and strategy. You start the game with four cards and are allowed to view only two. The objective of the game is to score the lowest points. Zeros are good, nines are bad. There are special picture cards to aid you during the game. Magnifying glasses mean that you can view one of your hidden cards. Draw 2s mean that you are allowed to draw two more cards from the deck at your turn. The exchange cards mean that you can swap one of your cards with another player. That is when it can get messy, especially when everyone seems interested in swapping for your cards! With everyone vying to become the beaver king or queen, the games are normally not short of fun and laughter. I recall the groans and grunts when a zero is thrown out or when someone swaps for another person's card yet only to throw it away and discover that it was a good card. With such great company, we all had a wonderful time. Looking back, it is heartwarming how friendships can be formed over a game of cards. Half the beaver gang left a couple of weeks ago to continue their travels. We had a Beaver Championships before the gang parted ways. Niklas even shaped a trophy out of aluminium foil. Christina and Stephanie were kind enough to leave their beaver cards behind for us as Nicola, Gwyn and myself coped with beaver withdrawal. 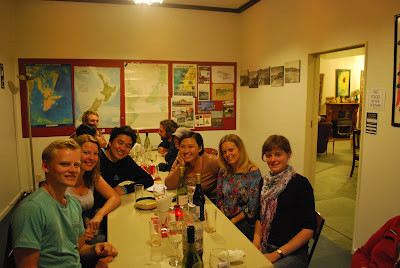 What started out as a random try out is now one of our favorite past times here in NZ. Maybe one day, we'll meet again for another round of beaver. Till then, keep in touch my beaver friends.